Payment accepted by Bank Transfer, Cheque or Cash and can be paid in full or in instalments. Payment must be made in full if holiday is less than 2 weeks away. A £50 deposit is required within 7 days of making your booking to reserve the caravan for the dates you require. 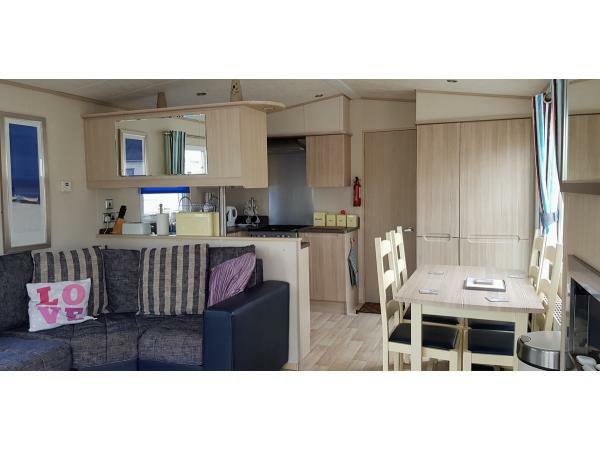 The caravan is complete with all you will need to enjoy your stay at Golden Gate Holiday Centre. 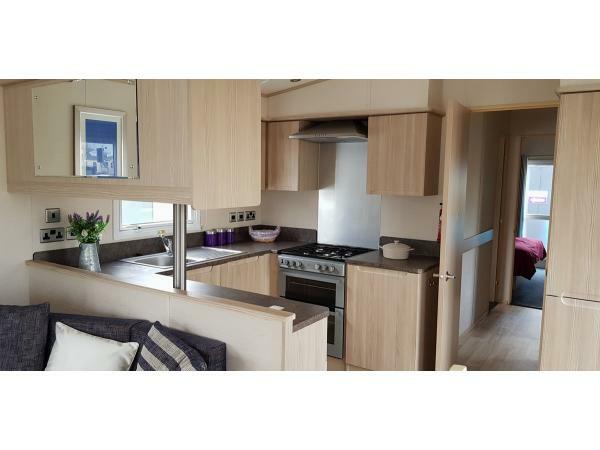 It has a very spacious set out and doesn't have the usual claustrophobic feel of some caravans. 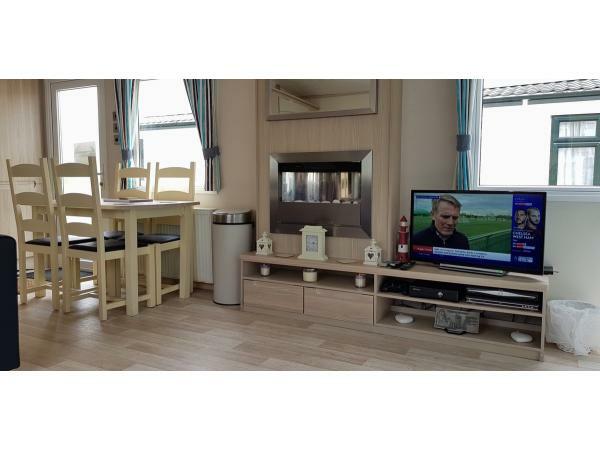 There is Sky installed and can be viewed with your own viewing card or the living room also has freeview TV with DVD player and very large selection of DVD's, a gas fire and central heating with wrap around seating and a pull out sofa bed. There is also an Xbox 360 with games for those rainy days to keep the kids occupied! The master bedroom has its own toilet and is very big and set out with lots of wardrobe and cupboard space as well a bedside cabinets. It has a TV/DVD combo an Xbox and games, as well as a large selection of dvds to view. There is a dressing table complete with hairdryer and hair straighteners. The second bedroom has twin beds and a wardrobe with a mirror as well as overhead cabinet space giving the room a lovely feeling. The Kitchen is fully equipped with a large intergrated fridge/freezer, oven, hob & grill, microwave, kettle, toaster, sandwich maker, Foreman grill, deep fat fryer and plenty of crockery & cutlery, all cooking utensils, pots, pans, oven ware, and a Dolce Gusto coffee machine. There is plenty of storage & work space and just about everything else you'd expect to find in your own kitchen. We also have a washing machine installed. We have a dining room table complete with chairs. Gas central heating with radiators in all rooms. There is a en-suite bathroom in the master bedroom. The family bathroom is combined with toilet, basin and a large shower. There is also an ironing board and iron, a vacuum and lots of cleaning products provided. We ask that you bring your own sheets, duvet cover and pillow cases as well as your own towels. Duvets, pillows and mattress protectors are all supplied and we do have some spare sheets and towels in the wardrobe that can be used along with the washing machine if required. Golden Gate Holiday Centre is a popular caravan park in Towyn near Rhyl. It is close to all amenities and has an on site Club (free entrance) with family entertainment. It now has it own indoor swimming pool and also Wi-Fi access available throughout the park, a kids club, restaurant, supermarket, fish & chip shop, and solarium. For children there is an Adventure playground, Amusement arcades, indoor soft play area on site. Near by local amenities include indoor pool, the beach. pubs, clubs, fairgrounds and gift shops. Also a market within walking distance runs every Saturday & Sunday at Tir-Prince with lots of stalls and a car boot sale.